The Town Hall will be closed on Thursday and Friday, November 23rd and 24th, in observance of Thanksgiving. Enjoy your holiday! While we list these as our regular hours, we are often here with the door open until 5:00 most evenings (except Friday) and through lunch during the week. If you had plans to come to the Town Hall during your lunch hour or between 4:00 and 5:00, please call ahead to make sure someone will be here. Town Administrator Cheryl Campbell swore in the Town’s new Police Chief and the newly appointed Town Attorney at the Board Meeting on Tuesday, August 1, 2017. Chief Jeremy Black has worked with Garden City in the past as a member of the Sheriff’s Office. He is setting up the new Police Department which is scheduled to begin police services on January 1, 2018. Town Attorney Amy Penfold has also worked with Garden City and is happy to be back with the Town. Ms. Penfold works with the towns of Pierce and Kersey as well as Garden City. Garden City Mayor Lonelle Archuleta and Trustee Fil Archuleta were recognized at the Colorado Municipal League’s Annual Conference in June. The Archuletas received plaques commemorating their commitment to their education as elected officials. The Colorado Municipal League (CML) believes that municipal elected officials investing time and resources to participate in educational events to increase their knowledge of municipal government and enhance their capacity to lead should be recognized. For this reason, in 1991 the CML Executive Board created an elected officials leadership training program, now known as CML’s MUNIversity. All elected officials from member municipalities are automatically enrolled in the program, and credits accumulate automatically for each training they attend. If you see the Archuletas, be sure to congratulate them for their accomplishments! June is Bike Month. 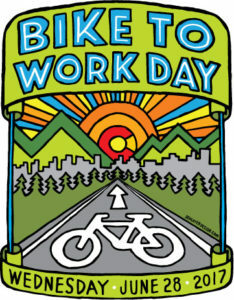 Get ready for 2017 Bike to Work Day, June 28. Spring cleaning for your file cabinet, the safe and easy way. Free to Garden City residents and businesses and hosted by Matson’s Construction and the Town of Garden City. The event will be held from 10:00 a.m. to 2:00 p.m. at 627 27th Street. This is a free service to residents and businesses in Garden City. Please be sure to get all your garbage into the dumpsters and keep the area clean. Items that are not allowed in the dumpsters include toxic chemicals, paint, oil, appliances containing freon (refrigerators, freezers, air conditioners, etc), and batteries. Call the Town Hall at 970-351-0041 for more information on Weld County’s Hazardous Materials collection site. On the first and third Tuesdays every month except December, there is a Town Board Meeting. It starts at 7:00 p.m. The public is welcome to attend any time, unless the Board decides to go into an Executive Session (that’s rare). You are invited to check the agenda posted here on the website or on the marquee on the west side of the Town Hall to see if there are any issues of interest to you. There are also special meetings from time to time. You can also learn about those meetings on the website. Look for the Agenda link at the bottom of the page or listed under Documents on the right side of the page. The Town Board consists of your Garden City neighbors. They’d love to see you and hear about your thoughts, concerns or suggestions. Don’t be shy! We’ve just updated our website to include links and phone numbers for various transportation services in Garden City. Did you know that Uber now services Greeley in addition to traditional taxi services? If you’re planning on heading to town for a drink or a party, consider getting a ride here and back home. It’s much safer and is well worth the money. Visit the Community Resources page for more information.